In May 2017, Google launched a new initiative dubbed AIY Projects, which is basically a DIY kit with Artificial Intelligence in mind. With this tool, Google is making work easier for developers who want to build different Voice or Vision-based interfaces and/or services directly into products. Well, the search giant has now brought Google AIY Projects near you – the Google Play Store. 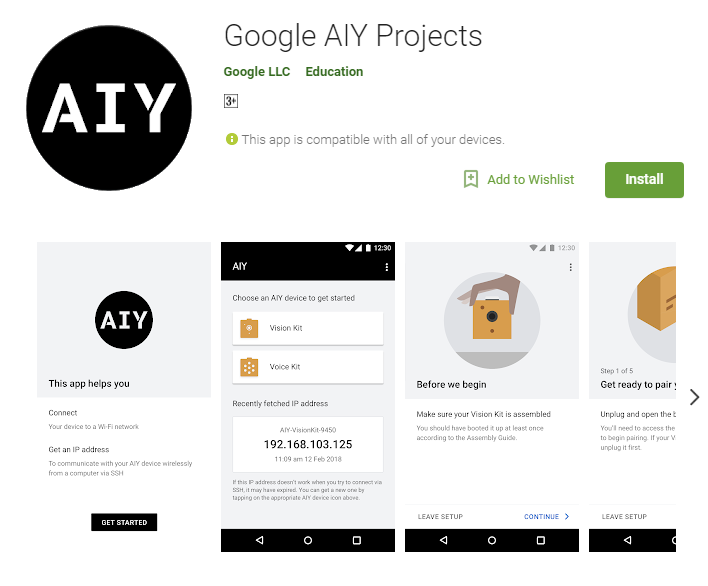 Yes, from today, April 16, 2018, it’s now possible to grab Google’s AIY Projects through the Play Store and install it on your device. Once installed, you should be able to connect your Vision or Voice Kit to a Wi-Fi network using your phone. The app lets you get an IP address that comes in handy when you want to communicate with your AIY Kit from your PC without using any cables or peripherals. The AIY Projects app, which is now on version 1.0.0.192550289, requires at least Android 4.2 and above and weighs just 2.4MB.